Wouldn't it be great to find a vacation that was the perfect mix of taking-it-easy relaxation and unique and exhilarating adventure-on-the-go, and still have money left over at the end of your trip? Thanks to today's far-reaching and affordable cruises, you can. No matter what your age or interest, today's cruises offer a great mix of relaxation and excitement, and offer package deals designed to fit into any budget. With just a little planning on your part, you can have the vacation of a lifetime at a price you can afford. While most cruises offer package deals that can have you humming all the way to the bank, there are several tips and tricks you can use to help your costs dip even lower. Knowing a few basic guidelines and following some simple advice can help you cut costs to the bone without sacrificing fun. The following ideas will help you get started creating the cruise vacation of your dreams on a budget you can afford. First order of business: plan ahead. If you've never taken a cruise before, knowing what to look for when you're searching for deals can be dicey. For the best results and most peace of mind, look for an agent or travel booking service that has experience dealing with cruises. These agents and services can ferret out even the most difficult to find deals and discounts, and can help design a cruise experience that's right for your needs, tastes, and budget. Consider traveling off-season. Depending upon your destination, off-season could be nearly any time of the year. Your cruise agent can help identify which cruise locations are hottest for the time you're looking to travel. Consider relocation cruises. These cruises typically occur when ships are repositioning themselves for an upcoming cruise season, and they can offer substantial discounts over other cruises. Again, your agent or booking service can be a real help in identifying these opportunities. Ask about what's included. Cruises today are known for their world-class cuisine, and most cruise prices include meal packages that can keep even the hungriest traveler well fed and satisfied. While many cruise lines are moving to the eat-when-you're-hungry philosophy, some still offer meals only at specified times. If you're the type that likes to graze all day, or doesn't want to be confined by specific meal times, be sure to ask about the types of meal programs available on your cruise. Also ask if snacks and beverages are included. Many cruises charge for these items, and some offer prepaid packages that allow you to have unlimited snacks or beverages for a low, per-day price. Many cruise lines offer package deals on wine, too, allowing you to pay a set price that entitles you to a specific number of bottles per day. These packages can yield substantial savings, so it pays to look into them. Ask about discounts on excursions. Especially if traveling in the off-season, your cruise line may offer discounts on excursions in specific locales, or discounts when more than one excursions is purchased. Also, it's a very good idea to book excursions early for the best prices and greatest availability. Ask about airfare deals. Many cruises partner with airlines to offer cheaper combined rates than if you booked them separately. If you'll need to fly to or from your embarkation place, your agent may be able to find a combo deal to save you cash. Similarly, some cruise lines partner with hotels located near the embarkation location, to offer discounts on rooms either before your cruise leaves or on your return, which means you don't have to rush straight from your plane to your ship or vice versa. Most cruise lines price cabins differently according to their location, with rooms on or near main decks and outside cabins being the priciest. To save cash, consider interior rooms. Not only are they cheaper, but they can offer more stability and less motion, a prime consideration for anyone who may need additional time getting their sea legs. Be sure not to book near the engine room or under the disco or other noisy venue. 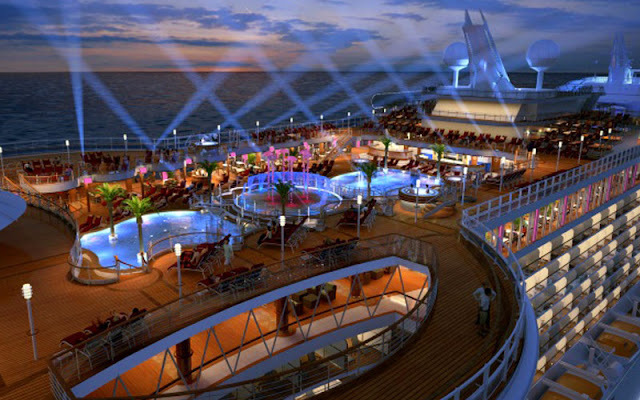 Sign up for newsletters from cruise lines and travel agencies or booking agents. Many times, these newsletters will offer discounts or alert readers to specials that can offer substantial savings on the overall price of a cruise. For the few moments it takes to register for a newsletter or alert service, you could save big bucks. Taking a cruise is a great option for people of all ages and interests who want to relax, experience new venues and sights, sample delicious cuisine, and keep a cap on their expenditures. Take your time and select a travel agent or booking service with experience in cruise travel to ensure your cruise is the trip of a lifetime.